When the referee blew his whistle for the cessation of the game there were scenes of great jubilation. The crowd jumped over the railings and rushed towards the Swansea players, whom they shook by the hands and congratulated upon the success. Duffy was carried shoulder high to the pavilion where a dense crowd congregated, and patted the players on the back as they went back to the dressing room. Cheer after cheer was raised for the Swans, and one of the spectators called out to Bullock, telling the Swansea skipper that the Cup ought to be presented to Swansea straight, away after their magnificent victory. It would be unfair to single out any Swansea players for special mention, for each and every one did his level best. All contributed equally towards bringing about the desired result. 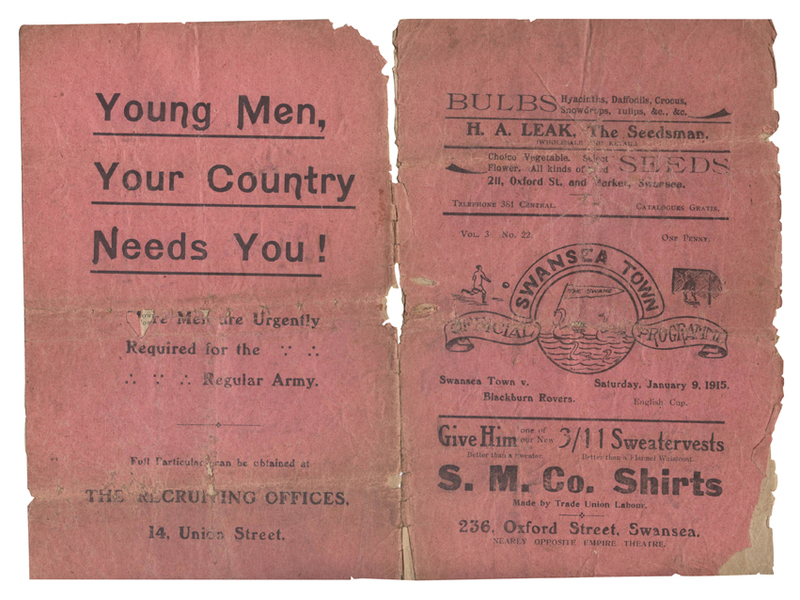 But for the fact that there is a war on, the Swans’ success would be emblazoned forth to all quarters of the world, and their praises would be loudly sung all over the country. Circumstances demand that we shall not attach as much importance to the game as in normal times, but still, ‘twas a glorious victory. During the chaotic period of the First World War, professional football as an industry struggled. It was treated with contempt by many, it being viewed as disrespectful to continue playing during a period of such tremendous upheaval. As a result, there was a backlash against football as a whole, especially in the media, meaning that a great many games in this period have become increasingly difficult to find records on. However, this should not take away from the tremendous feat that Swansea Town FC achieved over Blackburn Rovers in 1915. It was the club’s first “giant killing”. The fixture was the first round of the FA Cup, taking place on the 9th January 1915. This was the first year that Swansea Town competed in the competition, and it turned out to be a cup run that would, or rather should have been, unforgettable. Unforgettable because of the fact that this young club, currently in the second division of the Southern League, were drawn against the reigning champions, Blackburn Rovers. Held at Vetch Field, The Swans were able to draw upon their home support to help them attempt a massive upset. Even with the vitriol against football during these trying years, the game was still able to draw an attendance of 16 000 fans. This Swansea team were at a massive disadvantage in terms of experience; only the captain Thomas Hewitt had any international or high level experience, earning caps for Wales and playing with Chelsea earlier in his career. Benny Beynon, the young striker who would later provide the winning goal, had only turned to football after his original sport, amateur rugby, was suspended. Blackburn on the other hand, came prepared with a fantastically strong team, including four England internationals. Swansea, always being the underdogs, started the game on the back foot, with the mighty Blackburn piling on immense pressure. 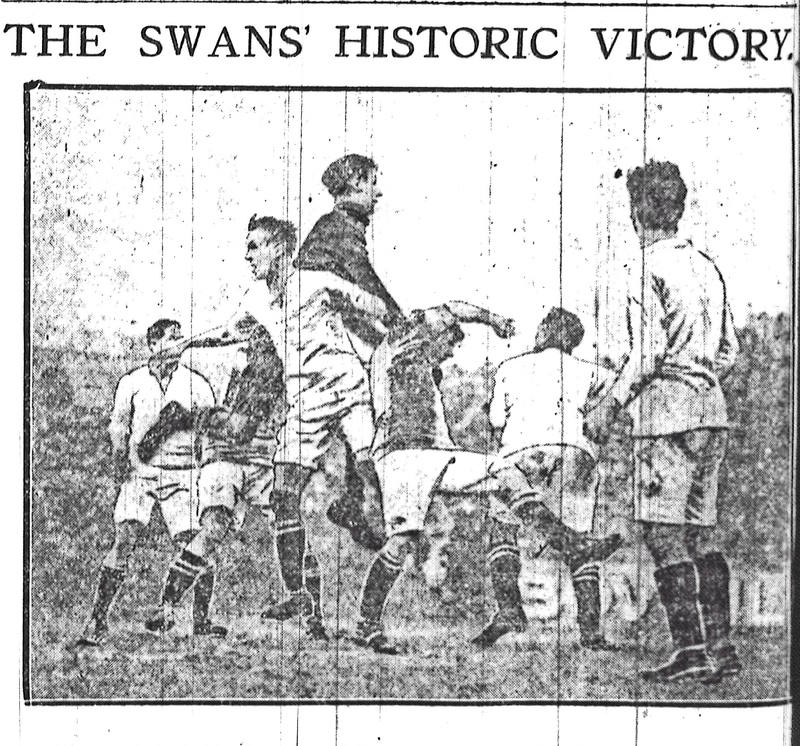 However, the Swansea defence, centred on Joe Bulcock and Jack Duffy, put in heroic performances and were able to weather the storm presented by the champions. However, Swansea were able to utilise a strong counter-attack, with Amos Lloyd being able to use his pace up the wing, with a pinpoint cross to Beynon, who was able to slot his shot neatly past the Blackburn goalkeeper. The second half presented even greater challenges for the still relatively inexperienced Swansea side, being reduced to ten men through injury and conceding a potentially game-changing penalty. However, luck proved to be on the side of the outsiders. Blackburn’s Billy Bradshaw had scored a phenomenal thirty-six consecutive penalties in the run-up to this match, but managed to mishit his shot wide of the post, much to the fanatical cheers of the home fans. The latter stages of the second half made the challenge for Swansea even greater, with Harry Read leaving the field due to injury. This left The Swans, still defending their narrow lead, with a major task. A task that they were able to pull off with a complete defensive team effort. When the final whistle sounded, it symbolised what Swansea Town were capable of, with a magnificent giant-killing of the reigning champions. Surely the Swans were in the second division of the Southern League not the Football League, which makes the result the biggest FA Cup upset of all time ! I’m pretty sure the page sdoes say the Swans were in the Southern League, but I’ll check. The most important thing is of course that you are right: whatever way you look at it that victory was one of the greatest in the history of the competition! What was the Swasea teams names that day. Dear Allan, if you follow the link to the programmes page and look on 1914-1915, the complete Blackburn programme is in there, with the team list. Sadly, Arthur Cleverley wasn’t playing! I assume you are related?